The Fondation Custodia is delighted to present in Paris a selection of drawings by Italian Renaissance masters from the exceptional collection of the Städel Museum, Frankfurt. During three months in the spring of 2015, the public has the opportunity to admire almost 90 masterpieces from the fifteenth and sixteenth centuries by Raphael, Titian, Michelangelo, Correggio and many others, that are on display in the exhibition rooms of the Hôtel Lévis-Mirepoix at 121 rue de Lille in Paris. One of the missions of the Fondation Custodia is to bring the very best of the art of drawing to the French public. The little-known collection of the Städel Museum is amongst these treasures that it wishes to share, and contains many magnificent surprises. Following in-depth analysis of the Italian drawings in a recent research project, original interpretations as well as new attributions await the public’s discovery in the exhibition catalogue written by Joachim Jacoby. The core of the collection is formed by the bequest of Johann Friedrich Städel, a banker and great art collector. His will, drawn up in 1815, resulted in the creation of Germany’s oldest museum foundation, the Städel Museum. The group of Italian Renaissance drawings was enriched in the mid-nineteenth century by art historian Johann David Passavant, and today forms a collection of the first order that illustrates the different artistic movements of that epoch. Before coming to Paris, this exhibition was presented at the Städel Museum in Frankfurt. The exhibition confronts visitors with a wide and representative selection of drawings from between 1430 and 1600, some of which are rarely or have never been unveiled to the public. The show starts with a number of remarkable fifteenth-century drawings: four elegant Gothic standing figures from the circle of Pisanello (c. 1430), a silverpoint study of a live model for a Crucifixion (c. 1450), a Venetian drawing of a young man looking upwards (c. 1500), as well as the exceptional mourning scene by Marco Zoppo (c. 1470). Between 1500 and 1525, Italian art took a completely new direction. This period was dominated by the artists Fra Bartolommeo and Michelangelo in Florence, Raphael in Rome, Correggio in Parma, and Titian in Venice, all represented in the exhibition. This generation of artists working in the early years of the Cinquecento produced pioneering works that would have a fundamental influence on their contemporaries and generations to come. Alongside Michelangelo’s Grotesque Heads (c. 1525), visitors can admire three drawings by Raphael including his Study of a Rider that was used for producing a fresco in 1511/12 for the Room of Heliodorus in the Vatican Palace, Correggio’s Seated Prophet with a Book (c. 1523), and Titian’s unique Study of St Sebastian for the High Altarpiece in SS Nazaro e Celso in Brescia (c. 1519/20). The exhibition also allows visitors to contemplate works from the second half of the sixteenth century from central and northern Italy, covering a wide geographical zone extending from Genoa to Venice. The drawings from central Italy, especially Florence and Rome, include works devoted to the demonstration of power and the refinement of court life. Among these are drawings by Pontormo, Vasari, Zuccari, Poccetti and Primatice, as well as Bronzino’s sketch for a ceiling fresco in the Palazzo Vecchio in Florence (c. 1539/40). Meanwhile, the selection from northern Italy will delight visitors with its striking drawings: Venus Mourning the Death of Adonis (c. 1560) by Luca Cambiaso of Genoa, The Adoration of the Magi (c. 1527/30), the Portrait of a Man by the highly influential Parmigianino, as well as the Study of the Head of Michelangelo’s “Giulano de ‘Medici” (c.1545/60?) executed by Tintoretto, presumably after a cast of the well-known sculpture in the Medici Chapel in Florence. 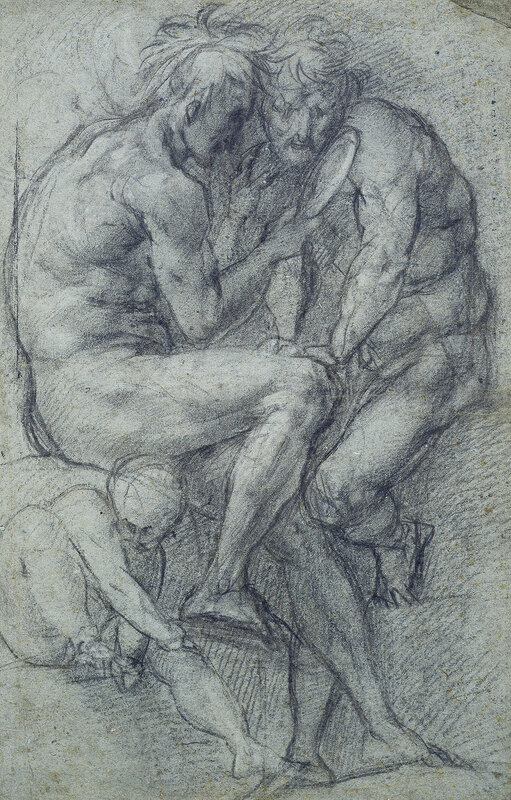 The works on display comprise preparatory drawings for frescoes and paintings, studies en plein air, landscapes, as well as portraits and finished drawings, independent artworks such as the black-pen depiction of Narcissus by Giuseppe Cesari, also known as Cavaliere d’Arpino (c. 1595/1600). The diversity and the quality of the works in the exhibition Raphael, Titian, Michelangelo. Italian Drawings from the Städel Museum in Frankfurt (1430-1600), provide an opportunity to contemplate all the functions and techniques of drawing in the Renaissance, a period in which this medium enjoyed an unprecedented heyday. Exhibition by the Städel Museum, Frankfurt am Main. Its presentation in Paris is made possible thanks to the generous support of the Wolfgang Ratjen Stiftung.